All of our Reverse Runner™ wooden fences are constructed of rough sawn Northern White Cedar design boards and framework and treated Red Pine posts. All of the fence designs are custom-built and hand crafted on-site, and customers have the option to change the style to meet their preference. The Reverse Runner™ fence designs are styled to be simple in design, but still decorative. All of the framework is on the backside of the fence. The posts are installed slightly higher, and at the end of each section. A standard beveled post cap is included in the fence design, however, customers can include Finial Posts, balls or a more decorative cap. 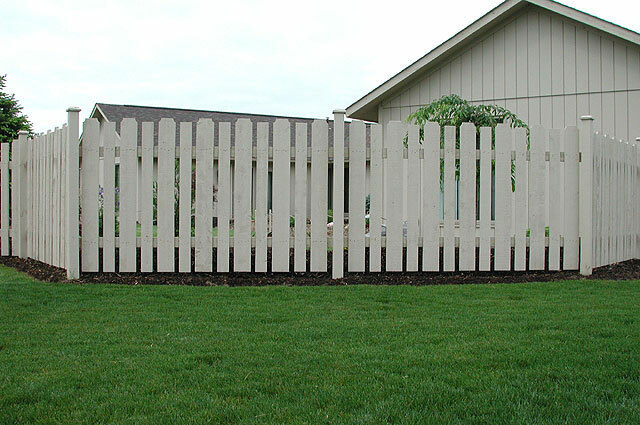 The Classic fence design in the board is similar to the common known "Dog Ear" design. It is more decorative and adds more enhancement to the home and yard. Our customers have the freedom and flexibility to make any desired changes to this design. Feel free to refer to our post cap page and gate page for further options. If you are curious as to how your fence will weather if left unstained, refer to our durability page for a photo. Don't be fooled by our name - Elyria Fence has been pleased to offer our fences, pergolas, trellises, garden arches, arbors and for installation in the following Ohio cities for 84 years: Akron, Amherst, Ashland, Avon, Avon Lake, Bainbridge, Bath, Bay Village, Beachwood, Bedford Heights, Belden, Bellevue, Berea, Berlin Heights, Birmingham, Boston Heights, Bratenahl, Brecksville, Broadview Heights, Brooklyn/Old Brooklyn, Brookpark, Brunswick, Carlisle Township, Castalia, Catawba, , Chipewa On The Lake, Cleveland, Cleveland Heights, Columbia Station, Copley, Creston, East Cleveland, Eaton, Elyria, , Fairview Park, Fairlawn, Friendsville, Garfield Heights, Gates Mills, Grafton, Hinckley, Homerville, Huron, Hudson, Independence, Kelly's Island, Kipton, LaGrange, Lakeside Marblehead, Lakewood, LaPorte, Litchfield, Lodi, Lorain, Lyndhurst, Macedonia, Maple Heights, Mayfield Heights, Medina, Milan, Monroeville, New London, New Russia Township, Northfield, North Olmsted, North Ridgeville, North Royalton, Norwalk, Oakwood, Oberlin, Ohio City, Olmsted Falls, Parma, Penfield Township, Peninsula, Pepper Pike, Pittsfield, Polk, Port Clinton, Put-In-Bay, Richfield, , Rittman, Rochester, Rocky River, Sagamore Hills, Salem, Sandusky, Seville, Shaker Heights, Sharon Center, Sheffield, Sheffield Lake, Sheffield Township, Sheffield Village, Solon, South Amherst, South , Spencer, Strongsville, Stow, Tremont, University Heights, Valley City, Valley View, Vermilion, Wadsworth, Wakeman, Wellington, Westlake, West Salem, Woodmere. We do not ship our products. We only service the above listed areas of Northern Ohio.